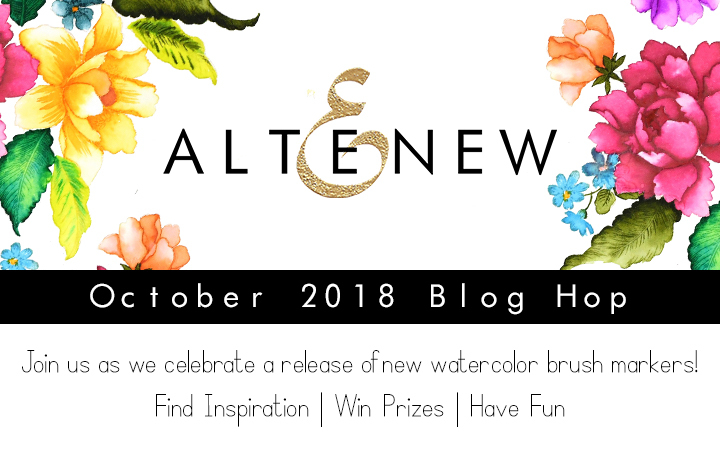 Welcome to the Altenew Watercolor Brush Markers Blog Hop and giveaway. Come from Sveta Fotinia's blog? Then you are right on track. For today's hop I created a quick and easy card. Emboss the larger stamp from the Happy Bloom Stamp Set with white embossing powder. Colour the flower arrangement with the brushes. Pop onto base and add sentiment. You can see how I created the card int the video below. I'm also giving away a $20 gift certificate. Just leave a comment by October 8th. I'll announce a winner on the 9th. Another gorgeous card by you! Lovely, LIlith! Very nice use of the markers and colors! love your card. sweet card - the yellow background helps to make the flowers POP!! I really liked how you used all the colors. I especially liked how you used them for the background. Beautiful! It was fun to watch this develop! Someone is going to be thrilled to receive this beauty! 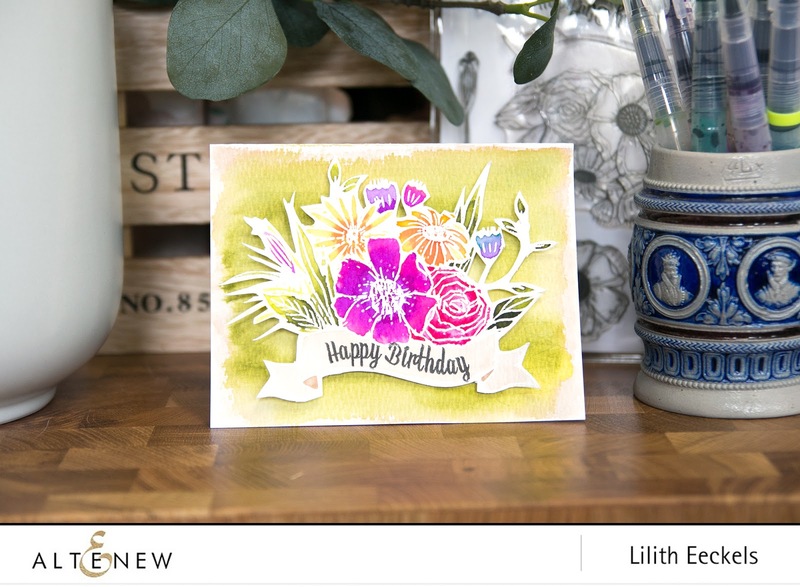 Such a pretty watercolor card! It's beautiful! I love how the pink flower really pops! Beautiful and cheerful card, Lilith!! Stunning card! Your coloring is beautiful! Thanks for sharing your talent. I enjoyed the video and it made me drool for the new brush markers. The colors are so vibrant and bold. Stunning card, I really enjoy watching you work & seeing the image go from lines to blooms, thank you for sharing. A very lovely floral card! These watercolors are very pretty. Such a fabulous and inspiring card! Bright and beautiful card.....I need more Birthday cards....this one is great!!! Thank you so much for sharing this lovely card....this Blog Hop has been wonderful today...thanks Altenew! 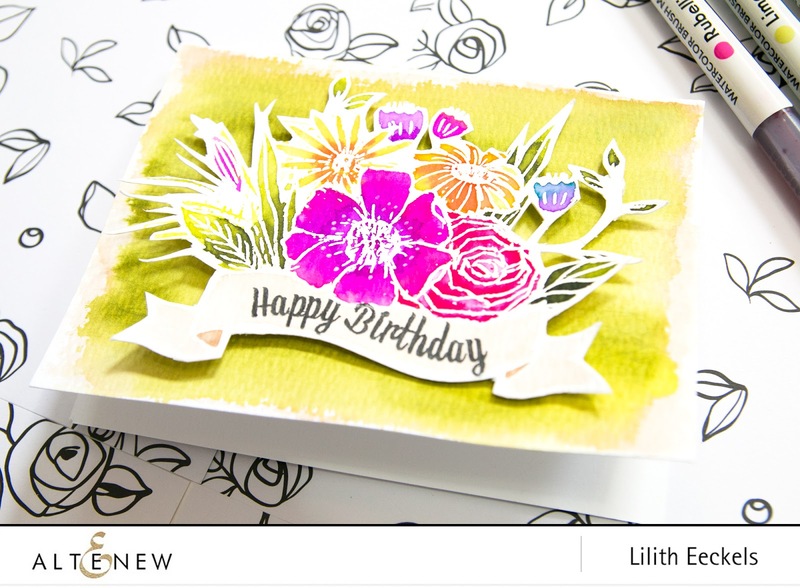 Lovely card, beautiful bouquet color combo with the soft water color background and thanks for another awesome video! This is gorgeous and i love how easy it seems to be to create with these markers. Wonderful card, video and colors! Can't wait to see how they match the watercolor paints! Beautiful colors! I love embossing! Your card is beautiful. I love how you embossed the design first and then colored it. Great job! Beautiful birthday card. Someone is going to love this. Thanks for sharing. Really love your card! It looks great! So gorgeous! Love the vibrant colours. These markers are fabulous! Your card is bursting with color and I love it! Thanks for the inspiration Lilith! I love the vibrant colors you used and tied everything together. These markers look amazing!! Nice watercoloring, hard to believe you are new to it. 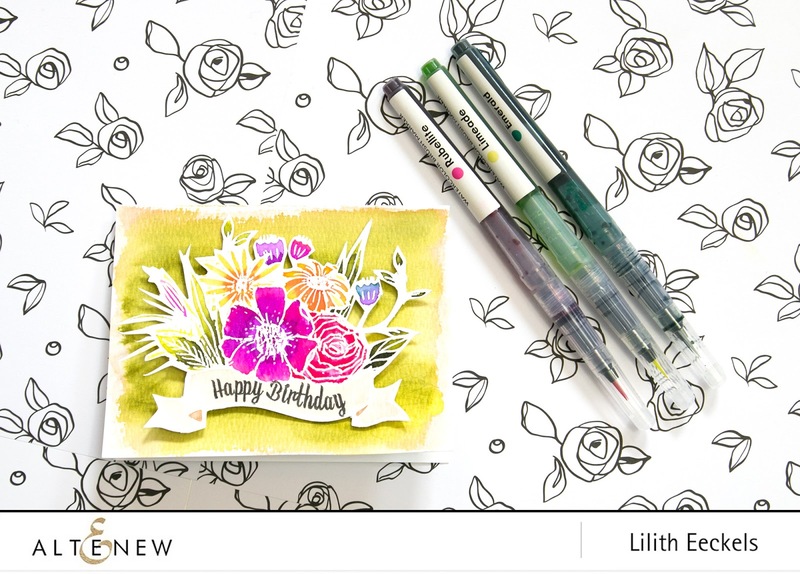 The design team has knocked it out of the park (as usual 😊) with this new product release and blog hop!!! Thanks so much for sharing your talent!!! Lilith, this truly is a happy Happy Birthday card & someone will be overjoyed to receive it. It will brighten their day. Gorgeous card. Love the bright, vibrant colors. Lovely, vibrant card. You make it seem so easy to create with these new watercolor brushes that I'm encouraged to try, too! wow, this is beautiful. I love that stamp set and you colored it so pretty. Love the background for the flowers. Pretty card. Very pretty card, thank you for sharing. Beautiful card! These colours are so bright and vibrant. Lovely color combinations on your flowers. Loving these new watercolor markers!TFS. This is very pretty! The coloring looks great and I love the background! I love the bright colors! It's beautiful! Thank you for the video tutorial—very helpful! Thanks for the inspiration! Have really enjoyed seeing all the lovely cards with these new markers. This is a great card to finish it off. Thanks. Beautiful card. I love your bright background with the flowers. So bright and vibrant! Hi Lilith. This is bright and cheerful. I really like how vivid that these brushes can be. Lovely showcase. Thanks for sharing. Gah! This is lovely! I just can't stop looking at it! I really need to buy this stamp set! It's so pretty! I love the way you used the new markers! Bursting with color and life! Can't wait to try it! Pretty flowers and I like the background. Am loving your sweet and beautiful birthday card! Beautiful card!! Love the way everything looks together...those markers are amazing and I can't wait to try them! Lovely design Lilith! These markers colors are gorgeous! Thanks for the inspiration! What a lovely card. White embossed designs sometimes intimidate me because I feel like the details can get lost. I think you combated this really well with your bright background; it helped offset the little details that might have gotten missed. Thanks for sharing with us! Beautiful card! These colors are just stunning! Gorgeous card! Love the color palette and beautiful composition. Beautiful! I love the background and the colors are stunning. Boy you sure got creative! Love!!! !